South African sprinter Oscar Pistorius says he thought his girlfriend was an intruder when he shot her four times through their bathroom door, because he has “been a victim of violence and of burglaries before,” according to his defence affidavit published in the London Evening Standard.The Olympic athlete claims he kept a 9 mm pistol under his bed and pulled it out when he thought someone had climbed in through an open window in his bathroom. He assumed his girlfriend, model Reeva Steenkamp, was in still in their bed when he shot through their locked bathroom door. South African authorities have charged Pistorius with premeditated murder, which means he must show “exceptional circumstances” as to why he should be released on bail, the LA Times reports. The purpose of this affidavit is to provide the above Honourable Court with my personal circumstances and to address the allegations levelled against me (in so far as they are known to me). 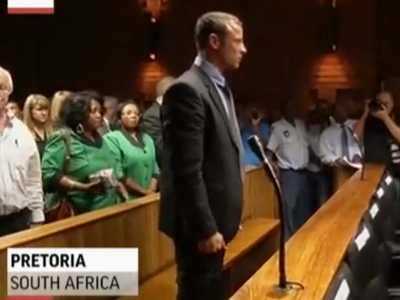 I fail to understand how I could be charged with murder, let alone premeditated murder, as I had no intention to kill my girlfriend, Reeva Steenkamp (“Reeva”). However, I will put factors before the Honourable Court to show that it is in the interests of justice to permit my release on bail. I state that the State will not be able to present any objective facts that I committed a planned or premeditated murder. For this reason I will hereunder deal with the events which occurred that evening. The objective facts will not refute my version as it is the truth. I am a professional athlete and reside at Silverlakes Drive, Silverlakes, Pretoria. I was born on 22 November 1986, at Johannesburg. I have resided in the Republic of South Africa (“the RSA”) all my life, and although I frequently travel abroad to participate in international sporting events, I regard South Africa as my permanent place of abode. I have no intention to relocate to any other country as I love my country. I own immovable assets in South Africa, which consist of the following: The immovable property in which I currently reside. This property is valued at approximately R5 million and is encumbered by a mortgage bond in the amount of approximately R2 million. Two further immovable properties located within Weeping Willow Estates, Pretoria East, which properties have a combined value of approximately R1,6 million. Both properties are bonded to an aggregate value of approximately R1 million. A vacant stand in Langebaan, Western Cape, which has a value of approximately R1,7 million. This property is not bonded. I own movable assets comprised of household furniture and effects, motor vehicles and jewellery, which are valued in excess of R500 000,00. My friends and family reside in the RSA, although I also have friends abroad. My professional occupation currently provides me with an income of approximately R5,6 million per annum. I have cash investments in excess of R1 million at various banks within the RSA. I have never been convicted of any criminal offences either in the RSA or elsewhere. There are no outstanding cases, other than the present, being investigated against me by the South African Police Services “SAPS”). I have been informed that I am accused of having committed the offence of murder. I deny the aforesaid allegation in the strongest terms. I am advised that I do not have to deal with the merits of the case for purposes of the bail application. However, I believe that it is appropriate to deal with the merits in this application, particularly in view of the State’s contention that I planned to murder Reeva. Nothing can be further from the truth and I have no doubt that it is not possible for the State to present objective facts to substantiate such an allegation, as there is no substance in the allegation. I do not know on what different facts the allegation of a premeditated murder could be premised and I respectfully request the State to furnish me with such alleged facts in order to allow me to refute such allegations. On the 13th of February 2013 Reeva would have gone out with her friends and I with my friends. Reeva then called me and asked that we rather spend the evening at home. I agreed and we were content to have a quiet dinner together at home. By about 22h00 on 13 February 2013 we were in our bedroom. She was doing her yoga exercises and I was in bed watching television. My prosthetic legs were off. We were deeply in love and I could not be happier. I know she felt the same way. She had given me a present for Valentine’s Day but asked me only to open it the next day. After Reeva finished her yoga exercises she got into bed and we both fell asleep. During the early morning hours of 14 February 2013, I woke up, went onto the balcony to bring the fan in and closed the sliding doors, the blinds and the curtains. I heard a noise in the bathroom and realised that someone was in the bathroom. I felt a sense of terror rushing over me. There are no burglar bars across the bathroom window and I knew that contractors who worked at my house had left the ladders outside. Although I did not have my prosthetic legs on I have mobility on my stumps. I believed that someone had entered my house. I was too scared to switch a light on. I grabbed my 9mm pistol from underneath my bed. On my way to the bathroom I screamed words to the effect for him/them to get out of my house and for Reeva to phone the police. It was pitch dark in the bedroom and I thought Reeva was in bed. I noticed that the bathroom window was open. I realised that the intruder/s was/ were in the toilet because the toilet door was closed and I did not see anyone in the bathroom. I heard movement inside the toilet. The toilet is inside the bathroom and has a separate door. It filled me with horror and fear of an intruder or intruders being inside the toilet. I thought he or they must have entered through the unprotected window. As I did not have my prosthetic legs on and felt extremely vulnerable, I knew I had to protect Reeva and myself. I believed that when the intruder/s came out of the toilet we would be in grave danger. I felt trapped as my bedroom door was locked and I have limited mobility on my stumps. I fired shots at the toilet door and shouted to Reeva to phone the police. She did not respond and I moved backwards out of the bathroom, keeping my eyes on the bathroom entrance. Everything was pitch dark in the bedroom and I was still too scared to switch on a light. Reeva was not responding. When I reached the bed, I realised that Reeva was not in bed. That is when it dawned on me that it could have been Reeva who was in the toilet. I returned to the bathroom calling her name. I tried to open the toilet door but it was locked. I rushed back into the bedroom and opened the sliding door exiting onto the balcony and screamed for help. I put on my prosthetic legs, ran back to the bathroom and tried to kick the toilet door open. I think I must then have turned on the lights. I went back into the bedroom and grabbed my cricket bat to bash open the toilet door. A panel or panels broke off and I found the key on the floor and unlocked and opened the door. Reeva was slumped over but alive. I battled to get her out of the toilet and pulled her into the bathroom. I phoned Johan Stander (“Stander”) who was involved in the administration of the estate and asked him to phone the ambulance. I phoned Netcare and asked for help. I went downstairs to open the front door. I returned to the bathroom and picked Reeva up as I had been told not to wait for the paramedics, but to take her to hospital. I carried her downstairs in order to take her to the hospital. On my way down Stander arrived. A doctor who lives in the complex also arrived. Downstairs, I tried to render the assistance to Reeva that I could, but she died in my arms. I am absolutely mortified by the events and the devastating loss of my beloved Reeva. With the benefit of hindsight I believe that Reeva went to the toilet when I went out on the balcony to bring the fan in. I cannot bear to think of the suffering I have caused her and her family, knowing how much she was loved. I also know that the events of that tragic night were as I have described them and that in due course I have no doubt the police and expert investigators will bear this out. I will stand my trial should it proceed against me. I am a well-known international athlete and there is no possibility that I will even think of not standing my trial should there be one. I trust the South African legal system and that the facts will show that I did not murder Reeva. I do not know the identity of any witness upon whom the State will rely in order to attempt to prove a case against me. In any event, I have no intention to interfere with any witnesses as I have no cause to do so and I undertake not to do so. I maintain good relationships with people and I bear no grudges against anyone. As previously stated, I have no previous convictions and I have not been released on bail pending any charges. I am not disposed to violence. I have two South African passports, the one is full. I need my passport to compete overseas but I am willing to surrender the passports to the investigating officer should it be a condition of bail. I am not in possession of any other travel documents and undertake not to apply for such documentation pending the finalisation of these proceedings. After the shooting I did not attempt to flee. Rather, I accepted Stander would contact the police, and I remained at the scene. I will be able to raise an appropriate amount to post as bail. I have no knowledge of any evidentiary material which may exist with regard to the allegations levelled against me. In any event, I believe that whatever such evidence may be, it is in the possession of the police; it is safely secured and I do not have access thereto. I undertake not to interfere with any further investigations. I am not sure which witnesses the State will rely upon in order to attempt to prove its case against me. Nonetheless, I undertake not to communicate with any witness, whoever he or she may be, and any other persons whose names may appear on a list of “State witnesses”, to be provided by the State. My continued incarceration can only prejudice me and creates no benefit to the State. I respectfully submit that should I be released on bail, my release shall not disturb the public order or undermine the proper functioning of the criminal justice system. I will comply with such conditions as the above Honourable Court may wish to impose. I accordingly submit that the interests of justice, considerations of prejudice and the balancing of respective interests favour my release on bail.